iPod Nano to sport camera? | Johns iPhone | iPhone Blog with Help, News, Tutorials, Tricks, Tips, and More! 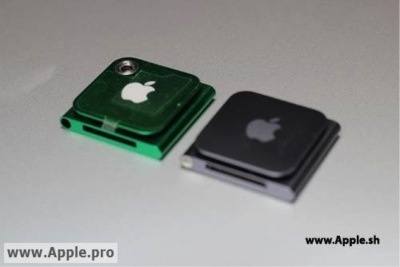 Home » Apple news » iPod Nano to sport camera? Previous to the all touch iPod Nano that was introduced two years ago, the iPod Nano sported a camera on the back that was capable of taking some halfway decent HD video. Some people have been asking for the return of the camera to the iPod Nano. The Chinese Apple rumor site, Apple.pro has made public what would seem to be a couple of spy shots with a couple of cameras. As a result, there seems to be a small hole that would have the place of the camera on the next Nano. These iPod Nano’s were quickly remodelled, in the next run though, and had its camera removed in exchange for a slimmer, sleeker, full touch screen that spanned the entirety of its small two-centimetre by two-centimetre squared body, and instead opted for a camera in the late iPod Touch. In a patent uncovered by PatentlyApple.com late last year has a sketch of the iPod Nano with a cutout exactly where the camera hole is in the spy shots. This shows that Apple has at least explored the idea of a camera in their latest version of the Nano, but did not intend to release the camera model at all. Do you believe that these spy shots are legitimate?